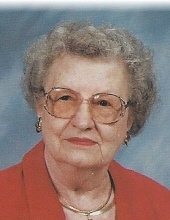 Irma D. Falk, 95, of Toluca, passed away Tuesday March 19, 2019, 4:51 pm at Unity Point Methodist Hospital, Peoria. Visitation will be Saturday March 23, 2019, from 9:00 to 11:00 am at St. John’s Lutheran Church, Toluca. Funeral services will follow at 11:00 am. The Rev. Joy Miller will officiate. Burial will follow at St. John’s Lutheran Cemetery, Toluca. Memorials may be made to her church or to the Toluca Fire & Ambulance Department. Calvert-Johnson & Froelich Memorial Home, Toluca, is in charge of arrangements. Irma was born January 11, 1924 in Toluca, IL to William Henry and Florence (Wink) Falk. Surviving are her nieces and nephews, Col. Charles (Julia) Morris, Williamsburg, VA, Kim (Gayle) Halverson, Algonquin, Scott (Elaine) Morris, of Valparaiso, IN, six great nieces and nephews and ten great-great nieces and nephews. Her parents and one sister, Alyce Morris, preceded her in death. She was a member of St. John’s Lutheran Church, Toluca. She had worked for thirty five years at IBM in the Los Angeles, San Francisco and Peoria offices. "Email Address" would like to share the life celebration of Irma D. Falk. Click on the "link" to go to share a favorite memory or leave a condolence message for the family.